Second of a three-part series. Click here for the first part. DAUPHIN ISLAND, Ala. -- It's the kind of stormy summer day on Alabama's Gulf Coast when Fae Chamblin, 72, can sit under the thatched-roof shelter of Dauphin Island's West End Public Beach and count by hand the number of visitors entering the park with front-door views of the Gulf of Mexico. As a volunteer attendant and informal ambassador for Dauphin Island, Chamblin embodies the kind of down-home warmth and salty personality that come with years of coastal living. Yet behind her platinum hair, freckled tan and welcoming smile, she is also counting the days until her beloved barrier island gives way to the sea. "A government geologist came down here one time and said we were either going to sink or wash away," Chamblin said. "I told him, 'It's already happening.'" An occasional series showing that although Congress remains divided over dealing with climate change, some states and cities are moving to adapt to more frequent storms, floods, drought, and rising temperatures and sea levels. Others aren't. Indeed, coastal experts and longtime residents know that Dauphin Island is in a race against time, its fate to be determined by sea-level rise, future hurricanes and the dredging practices of the Army Corps of Engineers, which maintains the 45-foot-deep Mobile Bay ship channel on the island's eastern flank, effectively excavating underwater sand that would naturally migrate to the island's beaches. Nowadays, Chamblin spends two days a week at West End Public Beach, collecting visitor entry fees, operating the snack bar and doing what she admittedly likes to do best -- talk about her imperiled island. "Have you seen that show 'Years of Living Dangerously'?" Chamblin asked, referring to the recent Showtime documentary series that relies on celebrity narrators to explain how climate change is affecting people, environments and resources around the world. "That's what we've got right here," she said, pointing to the slim, seaweed-strewn beach, where the waves at high tide break within 30 yards of the parking lot. Coastal erosion, storm surge and sea-level rise are all conspiring to wash the island away, or at least dismember it to such a degree that it no longer functions as a hurricane buffer, wildlife sanctuary, historic site or prime vacation spot. 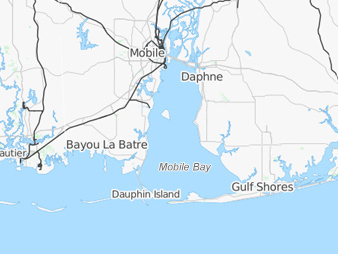 The breakup of Dauphin Island would also be one of the only known cases of a U.S. municipality giving up substantial parts of its landmass to the sea and put the state in the untenable position of seeing nearly half of its seashore lost or reconfigured, with huge implications for tourism, fisheries, transportation, commerce and hurricane resilience. Yet the state of Alabama is doing almost nothing to protect Dauphin Island and its roughly 1,300 residents from what experts believe is an avoidable outcome. In fact, the antidote to the problem of eroding beaches, called "beach nourishment," has been used successfully in other places around the country, including just a few miles east of Dauphin Island at Gulf Shores, where sand was pumped a decade ago to bring the high-rise beach resort city back to its former glory. But in the case of Dauphin Island, which has only a fraction of the tax base and none of the high-rise condos of Gulf Shores, critics say the state won't take its head out of the sand. Located 40 miles down the bay from Alabama's port city, Mobile, Dauphin was a populated and historic fixture in the region long before it became part of the United States around the War of 1812. It was from these very shores in 1864 that Confederate troops tried but failed to turn back the U.S. seizure of Mobile Bay. The event added to the legend of the Union Navy's rear admiral, David Farragut, who rallied his fleet with: "Damn the torpedoes, full speed ahead!" Dauphin Island, Ala. A historic island may soon be history. In modern times, Dauphin Island has suffered from increasing blows from nature's torpedoes, including a direct hit from Hurricane Frederic in 1979 and indirect blows from a half-dozen more hurricanes. The last one, 2005's Hurricane Katrina, leveled seaside houses, flattened sand dunes, peeled pavement off the island's roads and destroyed the vegetation that once helped hold the very island together. Then, in 2010, Dauphin was among the string of Gulf islands to be coated with oil washing ashore from BP PLC's ill-fated Deepwater Horizon platform, an event that cost the island tens of millions of dollars in lost tourism. It also cost Chamblin her business: Flamingo Fae's Beachside Grill and Tiki Bar. In what some consider a hasty move to buffer the island from oil, local leaders approved an emergency excavation of several million tons of sand from 22 large pits on the island's backside to construct a berm across the Gulf side. The berm has long since washed away, but the pits have now become water features, effectively thinning the island at another critical point. From his office on Mobile Bay's eastern shore, Scott Douglass isn't at all surprised by what he sees occurring on Dauphin Island, a place he has studied for 25 years since joining the civil engineering faculty at the University of South Alabama in Mobile and later as a private consultant advising similarly affected coastal communities around the region, including Gulf Shores. But he is mystified by the nonresponse to Dauphin Island's plight from state officials in Montgomery. Despite repeated warnings, including in face-to-face meetings with Gov. Robert Bentley (R) and senior Cabinet officials, about the inevitability of the island "falling apart" over the next decade, Douglass has been unable to garner support for a plan that he believes could save the island or at least buy it another 100 years of existence. "Barrier islands have a way to adapt to sea-level rise, and they've been doing it for about 6,000 years," Douglass said. "But these islands aren't just shifting sandbars anymore. They're fixed landscapes where subtle changes can make a big difference." According to blueprints drafted by Douglass for the town of Dauphin Island, contractors could pump fresh sand from offshore deposits in the Gulf of Mexico onto Dauphin Island's eroded beaches, essentially reconstructing and raising the beach's profile in a way that is more permanent than the berm intended to block oil from overwashing the island. Such a nourishment project would cost $30 million to $70 million, according to Douglass, with much of the attention going to a 4-mile stretch of beach where private homes are built atop wooden pilings to allow storm surges to pass underneath. In fact, many of the original seaside homes are gone, literally lost to the sea. Others have been physically moved and set atop newer, stronger pilings on what used to be higher ground. But even with the setbacks, many of the relocated homes are going seaward again, along with new properties that have been built or rebuilt after each hurricane. "We spent $1 billion putting sand on New Jersey's beaches last year [after Superstorm Sandy], and people who complained were told by the governor [Chris Christie] to get behind the program or get out of the way," Douglass said. "Here in Alabama, we can't get the governor to agree to put any money behind saving a barrier island that you can drive to and where people live. I just don't get it." 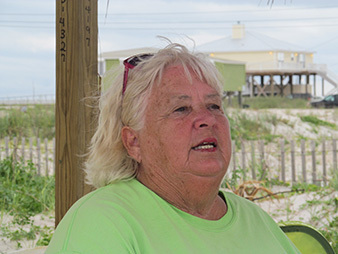 Fae Chamblin, a volunteer attendant at Dauphin Island's West End Public Beach, has watched her island disappear, bit by bit, for 28 years. Photo by Daniel Cusick. Calls and emails to the governor's office to ask about Dauphin Island's erosion and the state's position on climate change went unanswered. Pat Robbins, a spokesman for the Army Corps of Engineers district office in Mobile, said the agency does in fact place dredged sand in a "beneficial use area" south and east of Dauphin Island, where it can migrate through currents to sand-starved beaches. But the Army Corps has no formal monitoring program to ensure that the sand is reaching its intended targets. Asked whether Dauphin Island was being aided by the Army Corps' dredge operation, Robbins said, "Parts of it are, parts of it aren't. That's just typical of barrier islands." In an interview, John Christy, the Alabama state climatologist, said of Dauphin Island: "I don't understand why people build on sandbars. They are dynamic things. They are not fixed. They will move. They will decay. They will grow. And trying to nail one down by building houses on it, we're fighting Mother Nature." As for sea-level rise, Christy, who is also a distinguished professor of atmospheric science at the University of Alabama, Huntsville, said it's not the 1 inch per decade of rising ocean that Dauphin islanders need to worry about. "It's the 15 feet [of storm surge] that comes in with the next hurricane. And if you're not resilient to that, it doesn't matter what climate change is going to do," he said. But people who live and own property on the island are doing all they can to make a case for their continued existence -- a concept known in climate change policy circles as "adaptation." And they believe they have a solution that other states, like New Jersey and Mississippi, are already implementing to protect their coasts. Rather than remove sand from the system, like the Army Corps does to maintain the Mobile Ship Channel, Dauphin Islanders say they should receive all suitable material removed from the channel and more still from offshore sand deposits that could be pumped to the island via underwater conduits, just as is being done on a series of similarly battered barrier islands in neighboring Mississippi. "We see that as one of the best things we can do to protect ourselves," said Jeff Collier, 53, the town's part-time mayor of 16 years. "If we don't do it, then everything out here could be gone." A 2013 analysis on Dauphin Island from the Mississippi-Alabama Sea Grant Legal Program reached similar conclusions, noting that the island has "already experienced impacts from changes to the climate, and these changes and impacts are expected to continue into the future." Yet when asked about the relationship between Dauphin Island's fragile condition and climate change, the mayor chose his words carefully. "If you ask me if climate change is responsible the problems we have out here, I would say, 'I don't know,'" Collier said. "But I do believe we need to plan for the future as if it is happening. If we don't, we could lose everything." But there are others in Alabama who view Dauphin Island's fate on different terms and who believe any relationship between the island's slow destruction and climate change is an abstract scientific theory looking for a landscape to fit its fuzzy assumptions. Such arguments, made by residents like Mobile native J. Pepper Bryars, a former press secretary and speechwriter for Alabama's last governor, Bob Riley, in a recent op-ed in the Mobile Press-Register is that barrier islands like Dauphin Island are ephemeral landscapes, where "every few years it shifts, shakes and remakes itself like Mother Nature's personal Etch-a-Sketch." As for the role that human-induced climate change has in aiding that process, Bryars and like-minded Alabamians remain deeply skeptical. They point to data compiled by Christy, the state climatologist, that show Alabama's climate has experienced only modest warming over the last half-century and that extreme weather events happen with no greater frequency or intensity than they ever did. "Why are the changes and threats any different from past decades? Global warming advocates usually rely on two arguments: There's been a lot of bad weather lately, and the computer models show it's only getting worse," Bryars wrote. "But is that accurate, at least on a global scale? No," he added. Some Dauphin Island homeowners build bulkheads to slow beach erosion, but experts think they may even accelerate erosion of adjacent properties. Photo by Daniel Cusick. In a subsequent email exchange, Bryars acknowledged that "parts of Dauphin Island may be in greater danger of erosion that they were a few decades ago, but how about a few centuries ago? We must understand that the shoreline now wasn't what Mother Nature made 500 years ago, and it won't be what she makes 500 years from now, either." On the question of beach nourishment, Bryars added, "We may win, but it may come at a great cost. Residents and taxpayers will have to weigh the gains, risks and costs as the battle continues." But other experts, including Douglass, say the battle for Dauphin Island, and much of the rest of the Alabama coast, hasn't really begun. 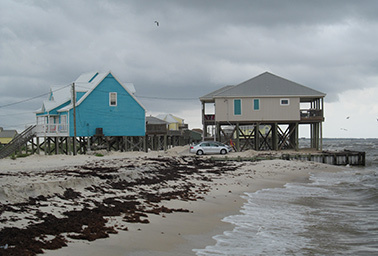 Since discussion of the need for large-scale remedies on Dauphin Island began a decade ago, after Hurricane Ivan, critics say Alabama has repeatedly missed opportunities to address the problem either through direct spending or by leveraging federal or private money that poured into the coastal zone after Hurricane Katrina and the BP oil spill. And in fact, they say, Alabama's coastal zone has become much more vulnerable both to extreme events like hurricanes as well as from often indiscernible changes in conditions, such as those created by strong tides, boat wakes, and even moderate wind and waves that churn Mississippi Sound and cause water to cross the low highway linking Dauphin Island to the mainland. Douglass noted that the absence of a hurricane along the Alabama coast for nearly a decade makes the extreme erosion experienced by Dauphin Island even more alarming. From his perspective, Dauphin Island and much of the rest of coastal Alabama has avoided catastrophic losses only by a combination of luck, pluck and the piecemeal efforts of private individuals and local agencies that have answered worsening conditions with impermanent fixes like riprap, bulkheads and truckloads of backfill to build up their eroding properties. "With every storm, we're losing more sand on Dauphin Island," Douglass said. "If we get a big storm in here, we're going to lose a lot more than one island. That whole stretch of coast will just fall apart." Monday: A message no one wants to hear.